Why teaching music theory to young children when all they want to do is play, can be the BEST way to help them play! Watch Glory St. Germain and special guest Shelagh McKibbon-U'Ren as they share 3 Tips and the "Secret Weapon" to effectively encourage, motivate and challenge students to complete their theory AND their practicing by using a little formula called "ICE". Shelagh McKibbon-U'Ren RMT UMTC is the Examiner and Editor for Ultimate Music Theory. Shelagh is also the author of the Ultimate Music Theory Exam Series and numerous UMT publications and blogs and Co-Author of the UMT Supplemental Series. Shelagh is a member of ORMTA and has a successful teaching studio, where she has taught piano, theory, voice, harmony and history for over 35 years. Shelagh's creative approach and special training in working with Educational, Emotional and Behavioral needs students empowers her to show students the Way to Score Success! Her mentoring, support and workshops for teachers are always in demand. Shelagh’s love of music and teaching shines through in her many recognized accomplishments. Shelagh McKibbon-U'Ren is Glory St. Germain's Special Guest on the Ultimate Music Interview Series. Glory: Welcome to The Ultimate Music Theory interview series. I am so excited to be here today to have a fantastic conversation with the amazing Shelagh McKibbon-U'Ren, who is my very special guest today. My name is Glory St Germain from Ultimate Music Theory, and I want to say a big welcome to Shelagh McKibbon-U'Ren. Welcome. Glory: Shelagh is an amazing person. She is my soulmate. Shelagh McKibbon-U'Ren is the coauthor on our new series, The Ultimate Music Theory ABC Beginner Series, as well as our Ultimate Music Theory Certification Course for teachers, and the exam series that Shelagh created and just so many more. We've actually written over 50 books together, and we're really passionate about sharing our musical journey. So in introducing Shelagh, other than that she's an amazing author, she's also a registered music teacher, she's an Ultimate Music Theory certified teacher. As in fact, she's our examiner. She teaches voice, harmony, history, music theory, tap dancing. But Shelagh, why don't you share a little bit about our journey and how the two of us became these passionate music theory authors together? Shelagh: It's funny. It's called taking a chance and stepping out of your comfort zone. And I'm not known for doing that. So, I like to consider myself the queen of theory because I want to do as much as I can to be able to provide my students with proper theory. So I created all of these worksheets and books, and I got a note from my music distributor because I have a little store here. And he said, "Well, you should check out this new series called Ultimate Music Theory." I said, "Okay. Send them to me because I need help. There's stuff that I am just not getting, and I just feel like a complete failure when I'm teaching it because I'm telling my kids, 'I don't know about modes. I'm not sure what they are, but you know what, you just have to do this little pattern and maybe it'll make sense.'" And then I got your book, and I started doing the basics, and then I did the intermediate, and then I did the advanced. And I remember being in the middle of Superstore at the checkout doing this theory book prying because I understood modes. I understood modes. It was so amazing. And then I thought, "Well, you know what, I need to send this lady an email and thank her for making mode so clear to me." So I did. I sent you an email, and I said, "Do you have any suggestions, or are you open to suggestions for some things that work with me?" And Glory said, "Sure. I'm always open for suggestions." And then, I think, my email to you was, what, 16 pages? Glory: Well, that was the funny thing. I remember that first email when you said, "Are you open to ideas?" And I went, "Oh, I love collaborating. I am definitely an open book and open to learning." And I said, "Oh, I'm so excited." To me Shelagh, you were a gift from God because I was looking for an editor, I was looking for a coauthor. Our business obviously, has grown tremendously in the last 10 years, and I still to this day, have those pages. So there was Shelagh sending me 15 pages, and not double spaced either, of all of these ideas. And I went, "Oh my goodness. I have to meet this woman." And I flew Shelagh to Winnipeg, and we collaborated as I was just getting into the Prep 1 and 2, and I had a fantastic time writing. And I think from that, we realized that sometimes students are so excited to learn voice and piano and violin and guitar, but as soon as you say that word theory, as was the experience for me ... I actually didn't like theory at all when I was a student. I just thought it was that, "Ugh, I have to do theory. How boring." But some of the things that you and I have really incorporated into the series is changing all of that. And when you think about the music theory, how can we make it fun, and especially when we get into our ... not only our young ones, but I think teenagers and students of all ages. And I think one of the things we should cherish, Shelagh, other than our ... well, we have to show the great adventures. If you're having a coffee with us today, can you just type in the word coffee in the chatbox? Because when you're on Facebook, what do you want to do? You want to have a cup of coffee, you want to have some fun, and if you learn something new, that's a bonus. So I do have to share my coffee cup. Shelagh and I have traveled all over North America from coast to coast, to coast, to coast together. So Shelagh, this one here was ... Do you remember that one? Shelagh: Oh, that was Las Vegas. Shelagh: Where we drove in a red convertible with the top down. Glory: ... up to dawn and we went backstage into the theater? So what about this one, Shelagh? Let's jog your memory there. Shelagh: That was in Halifax at the CFMTA Conference. And we were walking down at the waterfront and all these people were gathered around there and we said, "Why are you sitting there?" And they said, "Well, there's going to be fireworks." We were like, "Oh, whoa." So we sat down and there was fireworks. It was so amazing. Glory: That's one of my passions is fireworks. It's always on my bucket list. When's the next one? And we've got one more. This was a great gift Shelagh gave me. Shelagh: Oh, that was in New York. It's been on my bucket list to go to the Met, and we were invited to go to the Met as VIP guests. And I saw the most amazing opera live, and I was able to come back and tell my students that opera is so amazing. And they're like, "Opera?" And I was like, I said, "Yes. We got to watch this." So it's great. Glory: I think you just nailed it. Because when we experience all of those things ... sometimes people will say, "Oh, I'm not going to go to opera. It's not my thing." But have you ever been? Because you just don't know until you've experience it. And just as you said, stepping outside your comfort zone. Sometimes you have an aha moment and go, "Oh, I didn't think I would like opera. Oh, I didn't think I'd like going to art class and look at me, I'm painting all these pictures. I'm loving every minute of it." And I think when we're teaching our students ... and I know you're going to share three tips with us today about teaching music theory because a lot of kids do come into class just bored and think that, "I don't want to do music theory." As educators and professional teachers, it's our job, it's our responsibility to teach them. Whether it is voice or whether it is piano, how can we motivate them? So maybe we should talk about our So-La and Ti-Do before we reveal our three tips that you have for us. So I'll start with So-La. So here's So-La. And Shelagh's going to introduce Ti-Do. So when Shelagh and I were thinking about how can we be effectively teaching, we actually discovered that our differences are what makes us whole not only in our writing together, but in developing The Ultimate Music Theory certification course. And if you're interested in learning more about that, just type in UMTC in the chatbox and Shelagh will give you the direct link. You can get on the waiting list. We only open the program up about three times a year, so that'll get you on the waiting list. So UMTC. So here is So-La. So So-La, let's see what she's all about. So I am a So-La. So So-La feels music in her heart, and she loves to sing and dance and perform. So that's little So-La. So now Shelagh, you tell us about Ti-Do. Shelagh: Hi, my name is Ti-Do. I feel music in my hands and feet. I love to count, march and conduct. I'm a Ti-Do. I am absolutely a Ti-Do. Glory: And I know that I have to just draw attention to you feel music in your hands and feet. So tell us about your hands. Shelagh: I have degenerative osteoarthritis, which means that the blood flow through my fingers is not the best when it's winter here in Canada, which feels like that's about 10 months of the year. My fingers lock up, so I wear compression gloves and that just keeps the blood flowing through my fingers, and it really helps to keep the swelling down so that I can continue to teach. Glory: And all the time, I thought that you were like Michael Jackson, rock star... So we do have three tips today. So let's talk about ... you teach lot of students, and you teach a lot of young children as well. And it's really why we're so excited to talk about the Beginner ABC series. But what is your secret weapon that you feel really motivates, encourages young students to learn music theory in a fun way? Shelagh: So-La and Ti-Do. When we got the So-La and Ti-Dos and I brought them into my studio and I thought, "You know what, I'm going to really take to heart what So-La and Ti-Do are all about because I was tired of saying, 'well, I need you to play more dynamics. I need you to hold your hands properly.'" It was all about me, me, me, and I wanted the students to be able to have some fun. So I started this little challenge and I would say, "So-La says that we need to work on articulation. And So-La says we need to work on our dynamics." And the kids were like, "Oh, okay, well, I can do that." And I would say, "Ti-Do wants to challenge you to do a metronome challenge. And let's see if you can play with different metronome speeds. And Ti-Do thinks that you can do bonus pages. Can you do bonus pages in your theory?" And the students, especially my teenage boys ... and I have a studio where I have 47 students and then I teach Monday to Thursday, basically from 8:00 in the morning till eight at night. I'm truly blessed to be able to teach at a French language school here in town that's given me a studio right in the school, and that's why the kids refer to me as Madam Shelagh because that's how you speak to your elders. You speak to them with dignity. So madam Shelagh started to introduce these So-La and Ti-Do challenges and they just bloomed. The students were so excited to be able to say, "I can do that, So-La." And they would start talking to So-La and Ti-Do. And now we have a new challenge every month, where So-La and Ti-Do challenge them to do something more that's outside of their comfort zone. We take steps. Our newest challenges is our goal setting, and the children had to set goals. And one of the goals was to do more theory. Well, I can say, all right. You have to do more theory because theory is important. Theory is the foundation of music. If you go to school, you don't tell your school teacher, "Oh, I don't want my child to learn how to print because they're never going to need it. I just want them to learn how to read." I'm like, "No. You're supposed to learn how to read before you can lean how to print." And it's same with music. So Ti-Do started this challenge where the students had to... And then they had to do memory terms. So Ti-Do was all about the terms and doing bonus pages in their theory. The students embraced that and all of a sudden, I had students ... I had to put stop signs in their workbooks. Seriously, stop signs. One little guy who is diagnosed with ADHD and I got an email from his mom saying, "We can't stop him. He wants to do more pages in theory." And I thought, "Wow." Shelagh: It works. You've got a child with ADHD who has a special needs plan at school and is coming into his piano lesson and he is doing 10 pages of theory in his theory Beginner A book. So much so that I have to post that stop sign and say, "Please don't go past this because we won't have time to do it at the lesson together." Really became my secret weapons to encouraging and motivating students, so that they'd learn that they could take steps. They could just take those small steps and build their goals and build their confidence. I always say, "So-La says if you make a mistake, what happens? Does the piano blow up? Does it catch on fire?" So-La says we just take it a little slower. Like more step by step. And that's one thing that I found when I actually started to do The Ultimate Music Theory program because I started as a teacher and learning, and I discovered that there was actual steps that I could take to be a better teacher by following this step that Glory had put in The Ultimate Music Theory workbooks. And it was just so freeing. It was so awesome to be able to have a program that touched visual learners, auditory learners, kinesthetic learners, special needs learners. Glory: One of the things I wanted to share was that you just really tapped on something about how students really connect with So-La and Ti-Do. And by the way, if you don't have your So-La and Ti-Do pack yet, just type the words So-La in the chatbox, and we'll send you the direct link to get your So-La and Ti-Do pack, which also includes a whole bunch of other stuff and stickers and So-La and Ti-Do song and so on. But one of the things I wanted to share with you, we're talking about young children right now. However, I had one advanced student, she was doing her grade nine, level nine piano exam, and she is a definite Ti-Do. Very strict, very structured, everything is in time. And so that is her personality. She's like you Shelagh. She's a Ti-Do. And in order for her to really perform this, I thought, "What words can I use? How can I get her?" And I'm thinking, play more open, bring your arms away from your body. I'm just thinking all these things that I can do to get her into the performance mode. So I'm thinking and thinking and So-La and Ti-Do of course, are sitting on the piano because they're part of my studio. And finally I said to her ... Fiona is her name. I said, "Imagine that you're So-La? How would So-La play this?" And honestly, Shelagh, it was like magic. Her arms went away from her body. Her posture was a little taller, she played the most expressively I've ever heard her play. And I just went, "Who are you, and what happened?" And she said, "Well you told me to play like So-La and so I did." Well guess what? She got 90 on her level nine piano exam. Glory: 90. And it was because her mindset ... and when we have those little students that are shy, as you said, Shelagh ... Sometimes my students will talk to So-La even if they don't want to maybe talk to me because, well, I always put on a little accent. So-La has actually got a bit of an English accent in my studio, and they simply love it. They keep asking if So-La could please teach them the lesson instead of Miss Glory. And I get a little offended, I might say. But at any rate, it's just a fun exercise to do. And I think that's what it is. With students, whether you're teaching young children or those teenagers, you can apply the magic of your secret weapon, which is the So-La and Ti-Do. I know one other teacher. I think it was Kamara, who said that she actually used So-La the body to get really wonderfully curved fingers. And she said that was just ... it was soft, it was easy for her students to hold. And so there's a lot of cool things. Not only that, but of course they develop their own personalities. So we love So-La and Ti-Do, don't we Shelagh? Shelagh: Oh, I love it. You know what, Ti-Do has a little trick that he does. I have some, again, young students, and I don't put this huge pressure on them to play with proper hand positions. I encourage them to learn to build themselves so that they can play that because ... yes they have to play with proper hand positions, but if you're struggling to read ABC because you have dyslexia or you have a learning disability, I want you to feel positive. So we make it fun. If the students are playing and their wrists drop below the keyboard, Ti-Do goes on the attack like a shark... And then his little... is the shark fin. They go, "Oh, I got to get my wrists back up because Ti-Do is going to bite me." Glory: That is totally funny. I'm totally stealing that idea. Shelagh: If they see Ti-Do coming on like a shark... they know that their wrists are in the water, and they've got to get it up before Ti-Do bites them. And again, it's so much fun because I could say, "Lift your wrists up. They're dripping below the board." Or I could go... and they know. And then it becomes, "All right. I don't want Ti-Do to bite me." And it's safe. It's so safe for children to learn and grow and gain confidence because a little stuff that he says, "Hey, take a chance. Why don't you put that metronome on at 100? Oh, why don't we try 120? Let's see where we can go." And they're not disappointing anybody. They're taking a chance. They're building their confidence. Whether you've got ... I don't like to say normal students, but I don't have normal students. I have kids who just want to learn and have fun. And when they come in and say, "I don't want to do any writing work. I don't want to do any ...," things like that. I say, "Well, you're not going to do any writing work. You're going to have fun." Glory: I did an entire series of Facebook Lives on how we learn faster through game playing. And it is all a part of the studio experience. And in this day and age when often teachers feel like, "Oh my students, they have been put all the priorities. They'll have to go to soccer or have to go to dance, or have to do this, have to do that." And so why are students dropping out of music lessons? I know we talk a lot about the importance of how we can motivate our students, and in the certification course, we really drill deeper into learning styles and sub modalities and things like that. But it is really important to engage ... I think there's a fine line between being critical, if I could use that word, constructively and having fun, because I remember my teacher when I did my ARCT, and she wasn't really fun, but she was incredibly knowledgeable and she was very strict with me and I was the party girl and I still am. I'm known as The Ultimate Music Theory party queen. And I think one of the things that I find too, that we need to have the balance. And sometimes yes, we go and we have fun. And that's number one, is that if you're not ... because what do parents want for their children? Fun, joy, a great life, good health. All of those things that we all want. But they also want them to move forward in their music. And I think by using So-La and Ti-Do as a teaching tool and a challenge and all the great ideas that you have, it not only helps them learn because we are being strict, but we're doing it in a fun way. So I really like those. I have a question for you, Shelagh, because you do have a lot of students that you teach. Oh, and by the way, again, if you want to get your So-La and Ti-Do, just simply put your So-La in the chat and we'll make sure you get that direct link so you too can party like a rock star. So, what do you maybe consider the most important connection between the student and the teacher? How do you feel about that in your studio? Shelagh: The most important connection, I think, between my studio with me as a teacher and my students is that it's a safe place. My studio is a safe place, and if they don't understand a concept in theory, I don't want them coming to me and saying, "I don't get it. I'm stupid," because that's ... I grew up in a very strict ... you had to perform. We were at high performance expectations. And when my students come in and they say ... they'll come in with little tears in their eyes and say, "Madam Shelagh, I only practice twice." And I'm like, "Wohoo. Good for you. The amount of times you chose to practice. Awesome." So I want them to learn that choosing to learn is something that is easy, and we can just take those tiny little steps to make learning possible. So making learning possible is what my motto is, I guess you can say. When my students come into that door, I don't care whether you're dyslexic, I don't care whether you're with ADHD, ADD. I have autism spectrum students, I have students who have emotional needs, who need to have what we call those five minutes of the chocolate lesson at the very beginning of our lesson where they can just safely tell me what's going on in their lives, and then we can use music to make things better. And to be able to have a child do a page in their theory and go, "Oh, I get that. That makes so much sense." And then when they're playing the piano, we can go, "Oh, I get that. That makes so much sense." I had a student come and she's learning a song by Queen, and we're looking at that. She's going, "I don't get this. I don't get this." And I said, "Okay, let's take a look at those chords. If I was to write the chord symbols above, what is it?" And she goes, "Oh, it's f. Oh, it's f/a. Oh, it's f/c. Oh my gosh, I've got this." Glory: And that light bulb goes on, doesn't it? And I think when you really talk about those students coming in and that safe place for learning and when we really drill down on what is the type of student that comes into your studio, but not only are they ... some, as you said, just your average kids, if you can call kids average. But within those average kids or ADHD kids or if you're dyslexic, in addition to that, you're also a visual, auditory or kinesthetic learner. I know you and I really worked a lot on this when we did The Ultimate Music Theory course. As a linguistic practitioner, we really realized that ... And I remember that you found the quote that I love. Can you share that one? The quote. Shelagh: It's, if a child can't learn the way your teach, maybe you should teach the way the child can learn. Glory: Yeah. I love that. Shelagh: That changed my whole teaching when I was ... and taking The Ultimate Music Theory course. Everything that is out there for all the teachers to do, I've done too. And I was taking it and working through it and suddenly it dawned on me, and I had this feeling I should go back and apologize to students, 30, 40 ... because I've been teaching for 42 years. I used to teach because I was taught that there's only one way to learn and there's only one way to play. And I would look at theory and I'd go, "Well, I don't get it. It's telling me these things, but I don't get it." And I would get very frustrated. And then when I found The Ultimate Music Theory course, I cried many times because I finally got it. It really sunk in that if a student wasn't getting it the way I was teaching them, I needed to change how I was teaching them. Glory: It's such an aha moment. And I know for myself as I was going through the program myself as an educator and completing my certification as an NLP practitioner. When I started that, I thought, "Oh, I'm definitely a kinesthetic learner. I would have bet you money on that." I know a lot of teachers as they're working through the certification course, they think they have one learning style. But then when you actually drill through it, you go, "Oh, oh no. I'm a visual learner. Who Knew?" So I think as a teacher, when ... and I do want to share a quick story with you because it really was so dear to my heart. One of the teachers that completed The Ultimate Music Theory course, she called me one day, she's practically crying on the phone. She said, "Glory, I have to share this with you. I have a young boy. I've been teaching him for about three years, and I just don't seem to connect with him. There's just a disconnect and I don't even know why. And after completing your course, I realized that, oh, first of all," she said, "I am a kinesthetic learner. I know that for a fact." And she said, "And this young boy used to come into his lesson and he'd always say, 'Oh, could you play that for me?' And I always said, 'No, you read the music.'" And every week, he'd come in and he'd say, "Could you just play it?" And she'd say, "No, read the music." And she said, "After your course and understanding how to analyze my student's learning style, I realized he's an auditory learner." Oh my gosh. All these years, I've been teaching him as if he's like me. So she said, the next week he came in, which is why she called me. And she said, "I'm going to play a song for you, and then you're going to play it." And he was in complete shock. So she played on The Adams Family... And after she played it, she said to him, "Can you play that?" And he sat down and he played it verbatim... Immediately. And she was an awe. She said, "I can't do that." She said, "If you played a song for me and said, 'Go ahead and play it,'" she said, "I couldn't do that." She said, "You are amazing." And then she brought out the music, and they talked about the theory concepts that were in it because he was obviously working through his theory book as well. And she said when he left, he turned and looked at her right in the eye and he said, "That's the best piano lesson I ever had." She said she was just bawling her eyes out. She said, "I just had this breakthrough moment realizing that, "Oh, now I get it." If you're interested in learning more about the UMTC certification course, just type UMTC and we'll just send you the link. You can jump on the waiting list and learn more about it. Now, one of the things that ... well, we do have to show our books, but there's one more little tip. This is tip number three. So tip number one was your secret weapon, which is your So-La and Ti-Do. Use those personalities to motivate and educate your students. Secret weapon number two was understanding your students' learning styles and communicating with them in a safe place. And now miss Shelagh McKibbon U'Ren we are on, what the heck is ice? So in the Beginner ABC series, we did this really fun concept and I'll let you break the ice. And it's not the stuff that's in my front yard. Shelagh: I love ice. Imagine, compose, explore. I is for imagine, C is for compose, and E is for explore. And the wonderful thing about ice is there's no wrong answer. Shelagh: There is no wrong answer. For example, I had a student doing this page in the workbook theory book three in The Music Theory Beginner C book, and it was imagine, compose and explore. Imagine So-La and Ti-Do are riding a roller coaster. Compose a song using the white keys on the piano, explore the sound as the roller-coaster goes up high and down low and on the same note as the ride comes to an end. Now, my students said, "Well, why do I have to end on the same note?" I said, "Well, where are you starting? Where are you getting on the roller coaster?" And he said, "Oh, oh, oh. Okay. Okay." And you could see his brain going, and he was going, "Okay, they're climbing up the stairs and they're at Wonderland and then there they get on the roller coaster." And then he just went on exploring the chords... Did you realize that you just played an arpeggio? Did you know that you just played a dominant seventh chord? Did you know that you just did a glissando? And he's doing all of these things and he's getting stronger and straighter and bigger and he's saying, "I just created a composition, didn't I?" And I said, "Yeah, you did." And there was so much musicality in it. When you take music, if you take the theory and you just do it at the kitchen table, no, no, no, no, no, no, no. Take their theory and take them to the piano and make them see it, say it, write it, hear it, play it. Because even these little games that we have here ... I post a lot of my own little videos in my own teaching studio Facebook page because I have immediate permission from the parents and the parents like to see what we're doing at the lesson so that they feel that they're a part of it. But the other day, my hand was really swollen. We were in the middle of one of these ice storms here, so the air was wet and I'm looking at this page, but I said to my student, "My hands are too sore to play it. I want you to be the teacher." And he went, "What do you mean?" And I said, "Well, you have to decide which one of these are you going to play?" And you have to follow, and you have to see the notes, and you have to say them and hear them in your head, and then I'm going to tell you the answer." And you would have thought that I'd made him king for a day. Because he sat up, it was so awesome because he could decide where the music was going to go. And giving students that freedom to compose and explore and using their own imagination where there is absolutely no wrong answer, they have a little bit of guideline, whether So-La was picking apples and we had a talk about articulation because are they dropping on the ground and all of the apples going and flattening out? Were they dropping like staccatos? Were they dropping with a tenuto feel? And after the children composed and created, we explored it together as collaborists. I wasn't the teacher. I was just someone who was exploring with them. And giving a child the power to say "No, that's not what I wanted. I wanted this," is like giving them the keys to a musical kingdom that just opens the world for them. I have at least four students this year, who will be playing their own composition in exams and music festivals. Shelagh: They wrote it, and at two of them are actually duets that the students and I wrote together. Super Mario Brothers theme. But we took what they wanted and made it into music because we used ice. Ice was our breaking point. Ice was the way that I could break through to that student that all of a sudden theory wasn't just, "Uh, I've got to do the rules and write it this way, and it's either right or wrong." They had a chance to be creative. They had a chance to imagine, compose and explore. Glory: I think that's one of the fantastic things. I know when Shelagh and I collaborated to do the ABC series, we really thought about those young children. The ABC series is for children maybe six or seven years old, seven, eight, and I think when you can engage in the act of writing, we actually retain 30 to 40% more than just through doing it in our book. I've heard some teachers say, "Well, I just do music theory at the piano. I don't do any written work." But in fact, it's really important to engage in all three modalities, visual, auditory, and kinesthetic. And that's how we learn faster. Throughout the ABC series, you will see 12 lessons, which is the format that we use for all The Ultimate Music Theory rudiments workbooks. And you'll also see a little review quiz. And it is not a test, so there's no marks. Everyone, there's no such thing as failure. It's only feedback. It's only a lesson learnt. One of the things that I've learned too is that if you make a mistake, yes, you've learned something new. Glory: I love what Shelagh just said about doing the piece. That is such a good tip, Shelagh, where they're composing freely and ... Oh, if you are interested in learning more about the ABC series, just put ABC in the chat box and we'll send you the direct link so you can explore the ABC series with your students as well. It's just mapped out in such an easy to understand way. And of course, Shelagh talked about the So-La and Ti-Do. Hopefully, you can see a bit of the page because So-La and Ti-Do are a big part of learning because they taught students, right Shelagh? Glory: The So-La says and the Ti-Do tips, and it's really, really fun for students. I was going to say, I love the part where you said they went up the roller coaster and your students said, "Well, why do I have to land on the same note?" And you said, "Well, you got off at the bottom. You're not going to hop off and fall off at the top." That's brilliant because they can associate that so easily with understanding, well, that's the tonic. You got on, and now you're going to get off. And I think it's important too to give them those success tools. Sure there's rules that can be broken and so on. But first, we have to learn the rules before we can learn how to break the rules. Right? Shelagh: ... in this book. Shelagh: One of those four year old is one that I have to put the stop sign on because he wants to do more. It works. And when I do this with the students we have to do absolutely everything that's on the piano. I have different instruments in my room as well. I have the xylophone and the hand bells. I have a cajon, I have different drums. So if they get to pick their drum and they get to tap it. If it's a play thing, we get to pick our instrument and they get to play it. We make games out of these. Every page of this book with a four year old is an inspiration to learning. Shelagh: And then I tell you that I have a 60 something year old beginner who is in this book and who loves this book because she has arthritis like me so it's hard to write. The steps are a little bit bigger, they're easier to write and she's learning. So, it's the most wonderful thing. She always wanted to do piano and now she's doing it. So yes, you can use this book with any age, who's the beginner. It's absolutely fantastic with six to eight year olds, but my student studio is full of 16 year old beginners, 60 year old beginners and four year old beginners. I'm just letting you know from experience that if you take The Music Theory Beginner A was So-La and Ti-Do and you make every page about seeing, saying, writing, hearing, playing, which is all about having fun, you'll be actually teaching those kids and pre teaching them so many things. And I like to look at them and then I go, "You know what, you are just ... you've been pre-taught about tonality." And they go, "Okay, what's that? ", "It's something that you're doing right now." And they go, "Oh, I'm doing tonality." Once we get into the penta scales and it's major and minor, oh my gosh, I have them ... they're transposing everything there because they're just doing it by penta skills. Glory: I think it's one of the things that we were so passionate about in creating this. As a matter of fact, Shelagh and I were in California, and I remember sitting in and talking through the creation of this and just the whole mind mapping of how can we bring that to the young students. But I love what you said because actually I must admit that I have two 10 year olds and one 11 year old student that are ... they actually went through the Beginner A. Which book I holding up here? I'm holding up C. They went through the Beginner A book, then they went through the Beginner B book, and they've just started Beginner C. And so you're right. This really is not just, well, oh, it's a baby book, because it's not cartoon characters. One of the comments of ... a teacher said, she said, "Oh, I like your cartoon characters." And I said, "We don't have cartoon characters. What are you talking about?" And she said, "So-La and Ti-Do." I said, "No, they're not cartoon characters. So-La and Ti-Do are teaching tools, and we're mapping these out so that it's fun and engaging for children." So I think that when you explore these and implement these techniques in your studio, you're going to get that wow factor because things are going to go really fast and change from, "Oh, do we have to do theory," to, "Can I do theory? Can I get the next book?" So it is a series of three, Beginner A, Beginner B, Beginner C. And then that leads them into the Prep 1, Prep 2, basic, intermediate and advanced rudiments workbook. And if you haven't guessed by now, Shelagh and I are passionate about enriching lives through music education, and we're here for you. Shelagh, I got to do a couple of things. Number one, I want to mention that if you're not already part of our Ultimate Music Theory Facebook group, absolutely hop onto The Ultimate Music Theory Facebook group because we've got lots of good conversations in there. It's a group where we support each other as teachers. So you're not alone. There's no such thing as a stupid question. Just ask away. We're there to support you. And we also have The Ultimate Music Theory blog, which is an amazing resource for you. Most of the blogs are written by Shelagh McKibbon U'Ren. She's an amazing writer, and I love everything that you do. And she uses such amazing imagery that can really help you learn whether you're visual, auditory or kinesthetic. So I want to say thank you Shelagh for your amazing blog writing because I always put a smile on my face when I get to read those and share those with everyone else. So in wrapping up our three tips today, we learnt about the secret weapon ... Shelagh. Oh wait. Oh, wait. The So-La and Ti-Do show. I think Shelagh and I should do a show called The So-La and Ti-Do Show. Shelagh: So Glory, I sent you that picture of my student who finished his Beginner A book, and he thought that was it. That that was it, and he wasn't going to have any more fun with So-La and Ti-Do. And I went and I said, "Well, here's your book. Your Beginner B book." And he was like, "Yes. Yes." And the mom ran in from the waiting room and said, "I got the next book. I got the next book." It was so fun. He just made me smile. "Is this ok with it's worth?" He said, "I love doing this. We're having so much fun." Glory: I did an article a number of years ago for a homeschool magazine. And there was a parent who sent me an email, which I think we shared in a blog some time ago. And her son was autistic. And so he was in the Basic Rudiments workbook at the time. It was before we wrote the ABC series. He was 16 years old, and she shared that he was so obsessed with The Ultimate Music Theory Basic Rudiments workbook, and he went on to do his actual piano exam and he scored over 80%. He'd never scored that ever in his life. And she said, "This success, the program, the way that it's mapped out ..." When we first started writing this series, I did so much research on how to put together a publication that is for successful learning. And a big surprise to me was, do you know that you can actually buy a workbook that is detrimental to your learning? Who Knew? And it's because it's presented in such a confusing way, or it's just mapped out for whatever, without a lot of thought perhaps, behind it. If you're buying a book on mechanics and you can't figure it out, well, then the book wasn't very well written, and you're not going to be a mechanic. So when we started writing this, there was a lot of research and development going into, how can we make it easy to teach, fun to learn and help your students develop their musicianship skills? And I think the reason that we're so passionate about music theory is we are encompassing the whole musician. It's not just, oh I play by ear or oh, I'm a great sight reader, or I accompanied the choir, but that we're creating musicianship skills that will be a lifelong skill. And we want to want you to be playing for forever and having all of those opportunities. And it all starts with Beginner A.
Shelagh: That's right. These books, for me, don't just teach music. They teach children that something that looks tricky can be learned just by taking steps. And Ella says, "Let's just start at the very beginning. Let's just start here." And then all of a sudden they're playing, and they're creating and they didn't know that they could do that. And if you're given a goal, if you're at work or something and all of a sudden something is hard and all you think is, "Well, So-La says, just take the first step," you've created a human, not just a musician. You've created this ... It's just amazing. I've got a little two year old granddaughter and I kept ... she already knows So-La and Ti-Do. I am just waiting until she lets me actually teach her, because then I can put her in the books. And she's going to have so much fun. It's wonderful. Glory: She's going to have a blast. 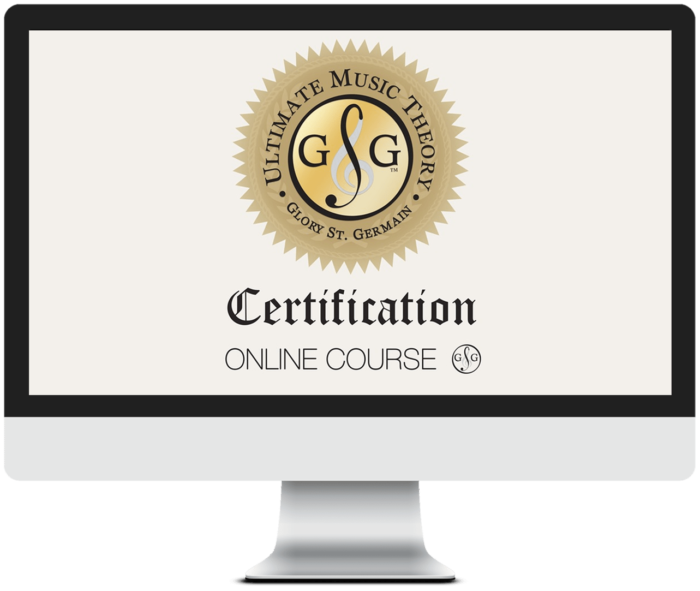 In order to learn more about what Shelagh and I do, please just type in the words UMTC in the chatbox, and we'll send you the link to The Ultimate Music Theory certification course. If you are a musician or a teacher that's interested in teaching, you can do the Beginner ABC series. And don't forget your teaching tips today using your So-La and Ti-Do stuffies that you can get. And we invite you to join us on our Ultimate Music Theory Facebook page. If you've enjoyed this, please put, "love it." Type out "love it" in the comments, and make sure that you love this link and please share it. We are passionate about enriching lives through sharing these things. I think in this day and age now that we have all these resources and we can share things via the internet, it's the most amazing time to learn because you can just learn by simply sharing things and networking with other teachers. And one other thing, Shelagh and I are going to be in Winnipeg, Manitoba, Canada for the CFMTA Conference, which is being held in Winnipeg this July. And we are planning on having a special VIP Ultimate Music Theory day or evening or lunch. We haven't got all the details worked out yet. But make sure that you connect with us on our Ultimate Music Theory Facebook page, and we'll send you more information on that. Thanks for the love. Oh, I see some love out there. Woohoo. I guess we should give a shout out to a few people. We see Marilyn Hooper, Pauline Ray Miller. We have to say congratulations to her son, Vovox, who is the youngest Ultimate Music Theory certified teacher in history. So, congratulations to Pauline. Raleigh Bly. Wow. This is great. Thank you. Marilyn, she said, all of her beginners are started Prep 1 last year, so how do we switch to B now? Yay. Shelagh: You just do it. If your kids are in Prep 1, because ... this is a new course, and if they're working through the Prep 1 rudiments and you're finding that it's going a little fast for them, then just put it aside and go right into the Beginner Music Theory B. I have done that with at least 10 students, and it's not stepping back, it's expanding. It's just expanding the learning field, so that they can then step back into where they were with the Prep 1 after they've done Beginner B and Beginner C. And they will have more knowledge and the ability to create more. So it's just giving them confidence. Go for it. Glory: Yeah, I agree with you 100%, Shelagh. And I did the same thing. I had a few very young students that were in the Prep 1, the green book because we hadn't written the ABC series yet. And as soon as they were out, I just said, "Oh, guess what, we're going to get to do the Beginner ABC series, so you can just put your green book aside for now. Let's do ...," and they are loving it. And they're moving so fast through it, so it is definitely ... yeah. And then we'll come back and we'll do the A or do that. "What age do you start them at? ", she said, "I have lots of preschoolers." So Railene ... I hope I'm pronouncing your name correctly. Shelagh said she's got some really young students in there. And I think that when you have kids that are engaged in music, whether they're ages three, four or five, they're ready to learn. I remember my daughter Sherry, when Shelagh and I were hanging out in Las Vegas driving our red convertible all around and going backstage to see Elton John and the keyboard player, we had such a great time, my daughter Sherry started ... when she was very young ... she was actually two years old, almost three, when she started in music lessons. I've actually taught music for young children for over 20 years, and I think that you need to start when you're two or when you're three, just like little Abigail, Shelagh's granddaughter. She's already curious. I saw her sitting at the piano, even if you're just there. So by all means, use the Beginner A book with those little ones. Hey, Janelle. She says, "So-La." Yeah. Grab your So-La and Ti-Do books for sure, because they're super cute. "Do you have Ti-Do trick to encourage kids to try watching the music instead of their hands?" It's an interesting thing that you said that Marilyn, because there are a couple of tricks. Ti-Do tricks. That's a good one. I like Ti-Do tricks, Shelagh. Ti-Do tricks. The other thing that I think ... and we talked a little bit about the visual, auditory and kinesthetic learner. So sometimes we think that they have to stare at the music. I'll tell you what I do when I'm teaching, is that when we're doing a new piece and their book is up at the top, I usually stare at their eyes. I want to learn, where are they watching? Are they watching the music? Are they looking at their hands? Are they staring out the window? Because they have the topography of the piano, they don't need to look at the keys. They have it memorized. And to this day, I have some students, advanced students that are doing the old look up, look down, look up, look down, because they just don't have the confidence. I think you can always pull the cover down, which is something that I do. Put a little blanket over it. What do you do Shelagh, when that happens? Shelagh: I take my little white board and put it under their necks. Glory: Good one. You know what? I'm glad you mentioned that. The whiteboard. Shelagh: This whiteboard is 10 years old and look at it. I use it every day. Shelagh: It's an amazing tip. So I put the whiteboard here. And then the other thing that I do, and this is actually something that I do with these theory books. When they have to do the CSA right here. If they have to see it, they have to say it, they have to write it, they have to play it. So if they're playing something that's in theory books ... and actually, they did this right here. On page 74, we had to write the notes. I have them put their hands in the C pentascale, which is ... Using pentascales is amazing. And then I say, "Okay, look at me. [Leigh Gin 00:51:48], now we're going to step down. We are going to skip up. Don't look at the piano. Look at me." And so they were playing sideways, and I just said, "You just played that, and you didn't look once. You didn't look at anything but me, following this along. Because when you tell your hands to do it, they do it." Glory: They do it. Yeah. It's such an interesting connection isn't it, between ... and think about how complicated it is to play the piano. You are looking here, reading this vertical line across, your ears are hearing sounds that are going up and down and loud and soft, and your hands are playing vertically, and then your foot has to go up and down. I think it should be an Olympic sport. I used to say that to my students, is that should be an Olympic sport. I think in wrapping up, we've had such a great time here. Oh my God. You're my longest interview in history. Glory: Well, I just think we had so much to cover, and I just want to say a big thank you, Shelagh, because it's been a lot of fun. Thanks for sharing your three tips, which were, what's your secret weapon, which is using So-La and Ti-Do as effective teaching tools in your studio. Number two was, an important connection is making sure that your students know they're in a safe place and that you're teaching to the student's individual learning style, visual, auditory and kinesthetic. And the third thing is use ice, imagine, compose and explore to create that connection of musicality in your studio. And would that, make sure to jump on and grab your ABC series. And UMTC is the code to put into the chat box if you'd like more information on the certification course. And Shelagh, of course, is your lovely examiner. Any parting words, Shelagh? Shelagh: I just want to thank you, Glory, for giving the opportunity here for teachers to learn from other teachers. I know when I grew up ... I grew up in a teaching community, and all the teachers were so closed minded. It was like they had secrets, and they had iron gates on them, and you couldn't learn. You couldn't. It was just taboo. And you've given us the chance to say, "You know what, this works for me guys." On the Facebook group, it's like, try it. It may not work with one student, but it could work with another student. Shelagh: And there's no stupid questions. I remember as a young teacher feeling, "Well, if I don't get this, I would apologize to my students. I don't understand modes. I'm sorry. Nobody can explain it to me." So just try. And now I understood modes because I asked a question, and I kept wanting to learn. So keep learning because the best teachers are those teachers that are willing to learn differently and accept that every student is a different learner. Shelagh: This is amazing. Thank you so much Gloria for giving us this forum. I appreciate it. Glory: Thank you Shelagh. We've got some fantastic guests coming up in The Ultimate Music Theory series, which is every Friday, live on our Facebook page. If you have a guest that you would like me to interview, if you have suggestions, make sure to put them in the chat box. And we usually reveal who was our guest of the week on Tuesdays after our Facebook Live interview. I want say thank you again to Shelagh, my superhero. Love you so much, and I will see you soon. Thanks for joining me today. Glory: Bye from So-La and Ti-Do. Shelagh: Oh, you got it.